Clinton cast herself as a model of "absolute rock steadiness" in foreign policy compared to Trump, reports the Washington Post, which notes that she seemed "guarded, even stilted" when dealing with questions about her email server and her vote for the Iraq War. Clinton said the Iraq vote and the email server were both mistakes, but insisted that she had never sent or received material with a classified header on her private server. "Classified material has a header which has 'top secret,' 'secret,' ‘confidential,'" she said, per Politico. "Nothing—and I will repeat this, and this is verified in the report by the Department of Justice, none of the emails sent or received by me had such a header," she added. Trump said that under Obama, the US has pursued "the dumbest foreign policy" he has ever seen, the Guardian reports. Asked about his claim that he knows more about ISIS than the generals, he said the generals "have been reduced to rubble" under Obama. Trump claimed that he had always been against the 2003 invasion of Iraq, but repeated that he thought the US should have taken the country's oil. Asked about his plan to defeat ISIS he said: "I have a substantial chance of winning—make America great again. If I win, I don’t want to broadcast to the enemy what my plan is." 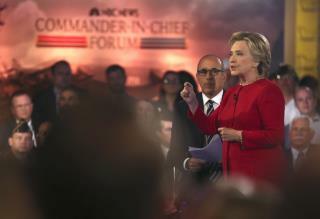 Clinton, asked about her foreign policy record, said she viewed the use of force as a last resort, CNN reports. "We are not putting ground troops into Iraq ever again and we are not putting ground troops into Syria," she said, arguing that ISIS could be defeated with air power and regional alliances. She said that no matter what he says now, she and Trump had the same position on both the Iraq War and the Libyan intervention, NBC notes. Clinton and Trump were both asked about veterans' mental health issues, and both promised to do more to reduce suicides. "We're going to speed up the process, we're going to create a great mental health division," Trump said. "They need help." Vox reports that Lauer is taking a lot of flak from both sides, with critics accusing him of asking lightweight questions and failing to fact-check the candidates. The Washington Post fact-checks the forum, and has plenty of Pinocchios to award both Clinton and Trump. Tim Mak at the Daily Beast gives terrible reviews to both the "defensive and lawyerly" Clinton and the "huckster" Trump. They were supposed to show how they were qualified to be commander-in-chief, but "both showed themselves to be both terribly flawed candidates," he writes. Trump just sang his "swan song." Bye, bye. The thing that we all seem to be forgetting is that we don't have to vote for either one of these idiots. Trump is shakier than Michael J. Fox on a chinese made shopping mall escalator, but sadly enough, Hillary's sub-comatose, mothball encrusted, shambling delivery makes him come off as rock steady as Clint Eastwood in a Hangem HIgh. Wow man.